Half the battle of getting out the door to paint, draw, or sketch is having your supplies ready to go. You don't want to have to spend time rummaging around trying to find supplies and materials when you have the opportunity to be painting and probably have precious time to do so. It makes it a lot easier to do some plein air painting studies or some urban sketching if you have all your art supplies together in one convenient pack and can just grab it, fill up on some water, and go. I started with a small camping or sports fanny pack I could easily carry while hiking or walking around a city. I selected the Bridger Supply Water Resistant Nylon Sports and Outdoors Hiking Fanny Pack made by Five Point Trading Company (Buy from Amazon). It is rugged and durable, has a couple of compartments and pockets for brushes, pens, and pencils, is big enough to hold a small watercolor and gouache set and a small 4"x 6" sketchbook, but is not too big, and is quite reasonably priced. The whole pack measures externally about 10" wide x 5" tall x 6" deep. The largest pocket is about 9 inches wide and can hold about 4 inches worth of flat materials, but is flexible and can be stuffed with other things as well. The medium pocket is about 6 inches wide and easily holds a small drawing pad, pencils, pens, and water brushes; and the outer pocket is about 4 inches wide. I keep the shoulder strap there when I'm not using it. There is also room for erasers, sharpeners, small flashlight, bandaids, mosquito repellent, small sunscreen, anything extra you might need. You can order a small or large waist belt up to 43 inches to fit various girth sizes. The whole bag, without any supplies in it, weighs less than ten ounces, so won't weigh you down. It is made of durable and rugged nylon, with ample cushioning for comfort. It is also water-resistant and machine washable. I love the fact that the pack has two water bottle holders, one on each side. I can carry one bottle of water for painting, and one bottle of water for drinking. I just need to be sure to remember to keep the two differentiated. A plastic bottle made for traveling works well for a painting bottle. The pack also comes in bright pink, neon green, and red if you want something more exciting than black and gray. The paint sets I selected for my traveling kit are the Sakura XNCW-24N, 24 Assorted Watercolors Field Sketch Set with Brush (Buy from Amazon). The 24 watercolor cakes are rich and the set is well-designed. It comes with its own refillable water brush, sponges, a built-in palette that clips into the side to make it easy to mix your paints, and a back that can serve as an easel for a small painting. The sturdy plastic case is small enough to fit in your jacket pocket, purse, or fanny pack and comes with a ring on the bottom of the box to make it easy to hold steady while you're painting. I also included a set of Holbein Artists Gouache Paints, Set of 12, 5 ml tubes (Buy from Amazon) for when I want opaque effects. These gouache paints have high density pigment and lightfastness. The small tubes make them very portable and convenient, and the high density pigment means a little paint goes a long way, so they are perfect for your ready-to-go art pack. I included some more water brushes in my kit, the Pentel Arts Aquash Water Brush Assorted Tips, Pack of 3 (Buy from Amazon) in addition to the water brush that comes with the Sakura Watercolor Field Sketch set. The water brushes are very convenient, easy to use, and eliminate the need to have to carry a lot of extra water around with you. 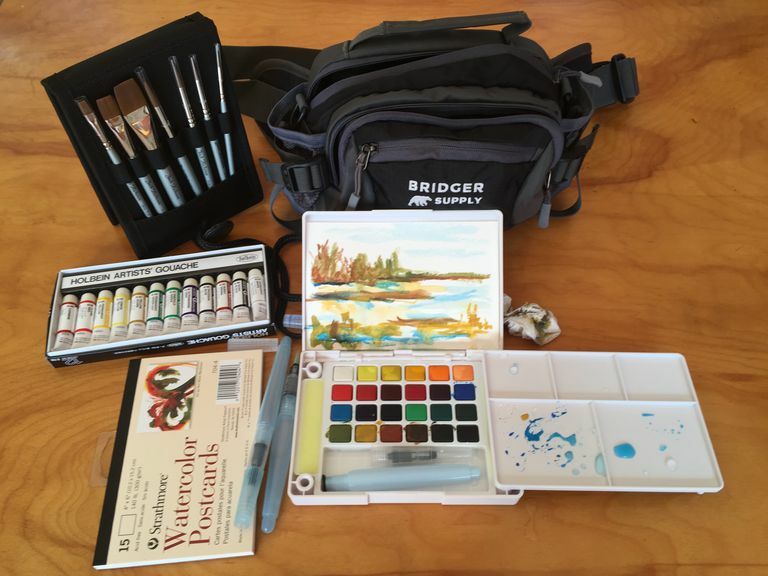 I also included the Jack Richeson Watermedia Pocket Plein Air Brush Set (Buy from Amazon). These are excellent synthetic brushes that come in a range of sizes of flats and rounds, are only 5 and 1/2 inches long, and are a very good deal for the price. They are perfect for water based media and come in a wallet that also can be folded back to display the brushes upright while you work. Strathmore Blank Watercolor Postcards pad of 15 (Buy from Amazon) at 4" x 6" are the perfect size to fit in the Sakura Watercolor Field Sketch Set and fit easily in the Bridger fanny pack. The Pentalic 100-Percent Cotton Watercolor Journal 5-Inch by 8-Inch (Buy from Amazon) is acid free and just fits nicely in the Bridger fanny pack, giving you a little bigger option for landscape studies and sketches. This is a durable sketchbook with excellent quality 140 lb paper. There is still room in the fanny pack for other supplies such as pens and pencils, erasers, sharpeners, some painter's tape, a small pack of tissue for wiping off excess water, and maybe even a candy bar for when you get hungry. 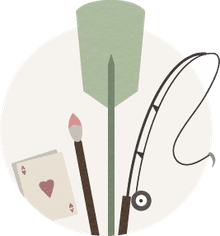 I hope this gives you incentive to make your own art pack and get ready for the next opportunity to get out the door and do some painting without having to put much time into preparation!